Delta offers a full range of Historic Resource and Tax Credit Services for projects that reuse, rehabilitate, or impact historic properties that are 50 years or older. We can assist our clients in determining if they qualify for the HTC program and the best program of action in order to become a Certified Historic Structure by the NPS. In addition, we can assist in determining if your building or project is historic and the best path to take for listing your building or property on the NR. Delta’s in-house expertise has collectively been involved with historic resources for more than 50 years, specifically in the preparation and review of Historic Tax Credit (HTC) applications and the preparation of National Register of Historic Places (NR) nominations. In consultation with our Public Funding programs, we will work with you to determine if you qualify for additional state or federal public funding. The HTC is a credit that is based upon a percentage of the eligible or qualified rehabilitation expenses (QREs). There are two credits: a 20% credit for historic buildings, and a 10% credit for non-historic buildings. Click here to read more. On July 2, 2013, Gov. Tom Corbett signed the Pennsylvania Historic Incentive Tax Credit into law as part of the overall statewide budget package. 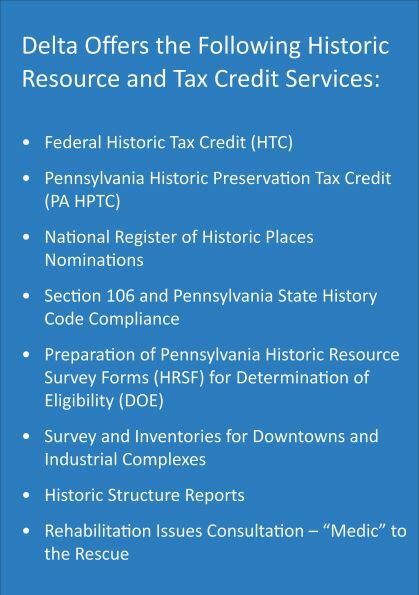 As a result, Pennsylvanians will be able to utilize a 25% historic preservation tax credit that can be used along with the 20% federal historic tax credit to rehabilitate older, historic buildings in Pennsylvania. ​Click here ​ to read more. The National Register of Historic Places is the nation’s official list of historic properties. Properties can be listed either individually, as part of a historic district, or as part of a multiple property documentation. Click here to read more. Section 106 of the National Historic Preservation Act of 1966 (16 U.S.C. 470 et seq. ), as Amended, requires that all federal agencies assess the effects of the use of federal funds or federal permitting on historic resources. Click here ​to read more.